I'm always on the look-out for a good Italian bread. This recipe is so versatile, it can be Italian Bread, Focaccia or Pizza Dough. Imagine that, three variations, one dough ... plus it's simple! Simple ingredients, simple to make, easy stuff! You can butter, garlic and add Italian herbs and more to the the dough before rolling up and shaping into loaf ... I love it and love what you can do with it! Wonderful served with any pasta dish or a bowl of my Cheesy Potato or Veggie Beef Soup! Increase speed to medium, and beat 5 minutes. Cover bowl of dough with plastic wrap, and let stand in a warm place (85°), free from drafts, 30 minutes or until doubled in bulk. Punch dough down, and let stand 10 minutes. 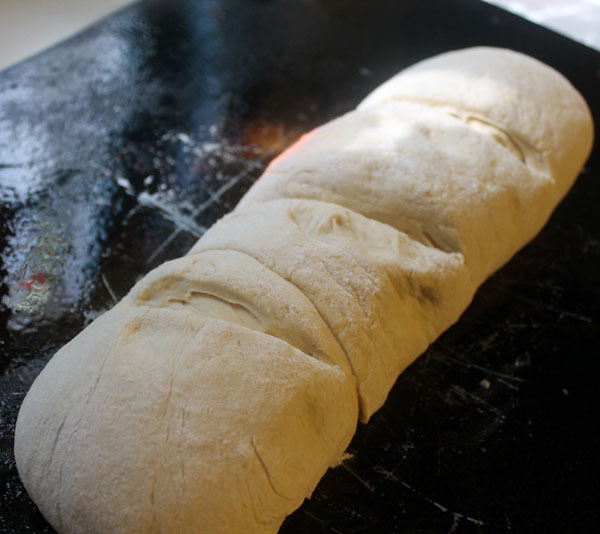 Turn dough out onto a lightly floured surface; shape dough into a 12-inch loaf (flatten dough with hands to 12" rectangle. Roll up from long end and shape into loaf). Place on a lightly greased baking sheet. Cut 3 (1/4-inch deep) slits across top of dough with a sharp paring knife. 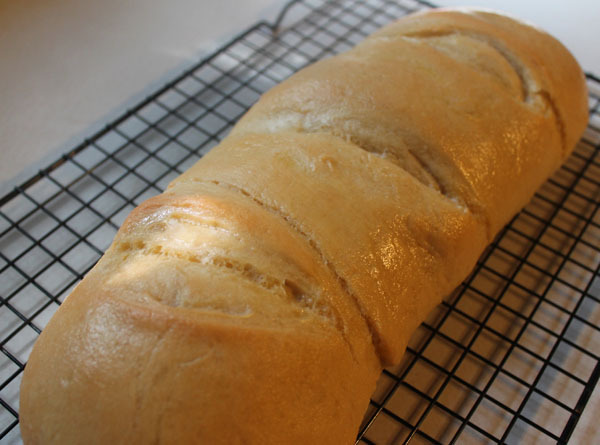 (The slits release interior steam and prevent the loaf from blowing apart at the side.) Brush with egg white wash for crustier crust, if desired (whisk 1 egg white with 1 tbls water). Bake at 400° for 16 minutes (approx) or until golden brown. Cool on a wire rack. Herbed Focaccia: Proceed with recipe as directed, shaping dough into a ball instead of a loaf. Roll dough into an 11- x 14-inch rectangle on a lightly greased baking sheet. Press handle of a wooden spoon into dough to make indentations at 1-inch intervals. Drizzle dough evenly with 1 tablespoon olive oil; sprinkle evenly with 1 teaspoon dried Italian seasoning. Bake at 475° for 12 to 15 minutes or until golden brown. Pizza Crust: Proceed with recipe as directed, shaping dough into a ball instead of a loaf. Roll dough into an 11- x 14-inch rectangle on a lightly greased baking sheet. Drizzle with olive oil, or spread with pesto or pizza sauce, and sprinkle with desired toppings. Bake at 475° for 20 to 25 minutes.